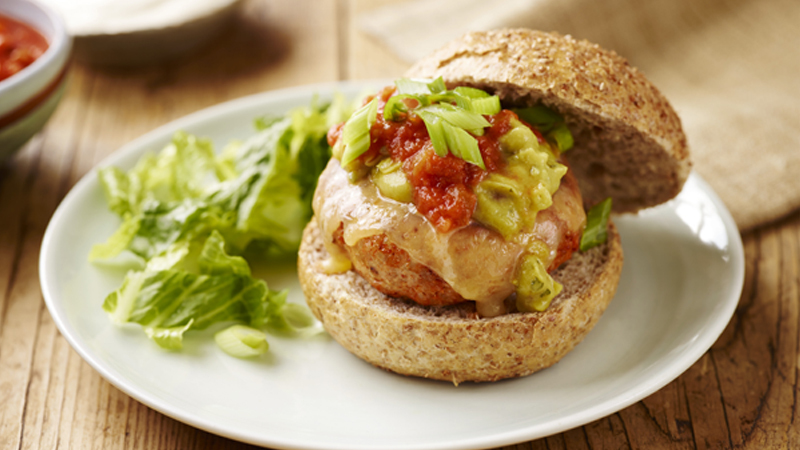 Jazz up simple chicken burgers with spicy taco seasoning and some Mexican toppings! 1. Place the chicken and seasoning mix in a large bowl and using clean damp hands mix together thoroughly. Divide and shape the mixture into four patties each about 1.5m thick. 2. Heat a medium non-stick frying pan over a medium heat. Add the oil and fry the burgers for 6-8 minutes on each side until golden brown and cooked through (with no sign of pinkness in the middle). Press down firmly with a spatula occasionally to ensure even cooking. 3. Preheat the grill to medium. Place each burger on one half of a burger bun and top with a slice of cheese. Pop under the grill for a few seconds until the cheese just melts. 4. Serve topped with a little guacamole, salsa, chopped spring onions and the top half of the burger buns. • You can cook these burgers on the barbecue too. Brush with a little oil before placing on the barbecue grill and turn frequently until thoroughly cooked. • Torn lettuce and soured cream are served with this burger.